Product prices and availability are accurate as of 2019-04-03 20:43:36 EDT and are subject to change. Any price and availability information displayed on http://www.amazon.com/ at the time of purchase will apply to the purchase of this product. Anthriscus cerefolium Curly Leaf Chervil looks much better than regular Chervil and has same flavor. Chervil is a close relative of parsley, is sometimes referred to as French Parsley and Gourmet's Parsley. 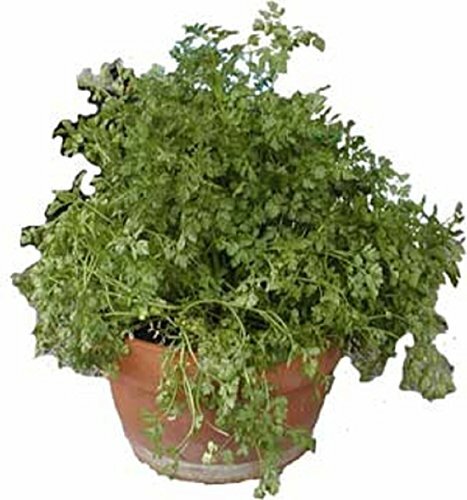 It has a delicate, spicy-sweet, mild anised, parsley-like taste and aroma. Great addition to soups, fish, vegetables and cheese dishes. Popular in French cuisines. Chervil likes to be quite well-watered, and dislikes being hot or even really warm. Chervil notoriously bolts quickly, especially in the warmer months; keep its leaves pinched to prevent the small, white flowers from developing (and subsequently forming seeds). Grows well in containers.